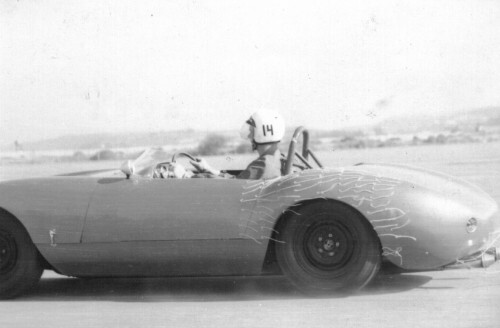 "With a team of 5-10 we built a prototype production car and I financed (company funds were tight) the lightweight racing version, the Santee SS. The production car had a 185 HP Buick 215 CID aluminum V-8, Pontiac Tempest transaxle and Corvette metallic drum brakes (there were no US-made disc brakes in 1961). We designed a fiberglass body, rigid space frame chassis, and F-1 type independent suspension." "Here's a "Tuft test" of the airflow over the Santee at Del Mar." 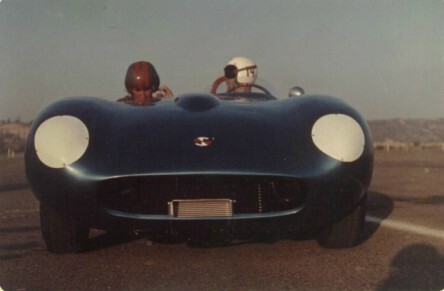 In blue t-shirt, Puhn looks closely at Dave MacDonald's "00 Corvette Special". In blue shirt, Puhn peers at Bob Harris's innovative "Campbell Special". "My SS had the Olds HD version (with big valves, etc) not available from Buick. We mounted four 45DCOE9 Webers and an Isky Cam. The headers were F-1 type 180 degree design, so each of the twin exhausts had even exhaust pulses-- which made a wild non-V8 sound! Power was 250+ HP." "The production version weighed 1850# and my SS weighed 1400#. The SS would turn the 1/4 mile in the low 13 sec bracket with road racing tires! Unfortunately, the stock market crash in the Fall of 1962 ended the production hopes of the Santee. Today all 2-1/2 Santees are owned by Fred Puhn and are in the process of being restored. Fred hopes to race the SS at the San Diego/North Island Vintage Car Races in October, 2001." At Del Mar near San Diego on Sept. 29-30, 1962. 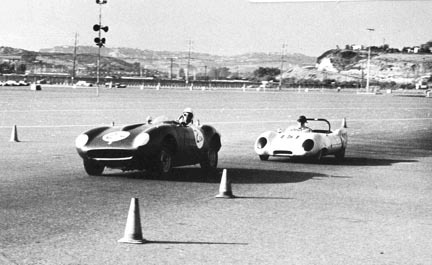 The Santee, driven by Willie West, leads Don Maslin in his Lotus Mk.11. 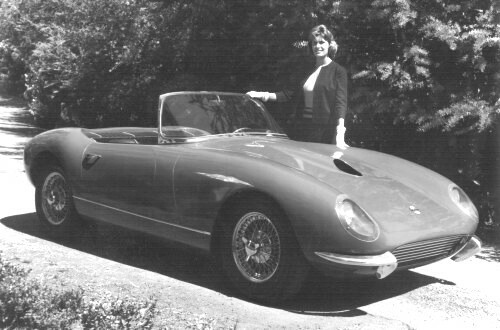 "I think this was 1963 and it was driven my Oceanside car dealer and road racer Willie West [Willie rans Alfa's and ran a Fiat-Abarth at Sebring, one year]. If we had been prepared, Willie was going to drive the SS in the Times-Mirror race at Riverside, that year, but problems with the economy and the Santee business precluded any pro race." John McCann in the Santee at Del Mar on Sept. 28-29, 1963. 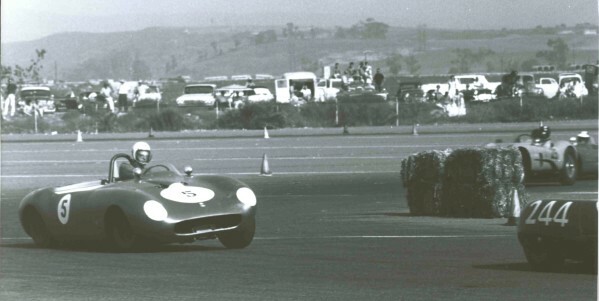 He trails Frank Monise in #244 Lotus Mk.23 and leads Jim Chaffee in the "Pink Elephant". This was McCann's last road race.